"Located in the village of Chichée, southeast of Chablis proper, the Picq family has farmed its small collection of vines for several generations. Today, the estate is in the deft hands of Gilbert's two sons Didier and Pascal, and his daughter Marilyn Picq, each with their defined roles: Pascal is in the vines, Didier is in the cellar, and Marilyn manages the business. The Picq style of Chablis is classic, with the inimitable expression of minerality that the chardonnay only picks up in these rolling hillside vineyards of the Yonne Valley, coupled with racy acidity and fine depth that comes with low yields, meticulous winemaking and fine parcels of vines. The wines are naturally fermented and raised in stainless steel tanks to protect the underlying expressions of terroir. You won't find a single stave of wood in the entire winery. Pascal Picq does severe pruning each winter and routinely thins the crop twice in the summer months. The serious work in the vineyards can be felt immediately in the Picq wines, as even the Chablis villages and the old vine cuvée offer up a depth and intensity of flavor in the mid-palates that is most often associated with at least premier cru level wines. The estate does not own a large spread of vineyards, which may also account for the exceptional quality of their Chablis AC bottling. Didier feels it serves as the calling card for the domaine, and thus, gives it a great deal of attention. It is both an exceptional value and among of the finest examples to be found in the appellation, with the structure and cut to age gracefully for up to twenty years. Next in the lineup is the Vieilles Vignes bottling made from the oldest parcels of vines in their village wine holdings (more than fifty years of age). It is a deep, rock solid and racy example of Chablis, with a minerally-infused personality and great purity of fruit, and a brisk acidity that allows it to age gracefully for fifteen to twenty-five years in top vintagse. It is easily the quality equivalent of a top premier cru. Domaine Gilbert Picq et Ses Fils also offers up a pair of fine premier crus, both located in the village of Chichée. These include a beautifully pure and complex bottling of Vaucoupin, one of the very underrated premier crus in Chablis, and a more powerful, but equally soil-driven premier cru of Vosgros, which is produced from the family's oldest premier cru vines. Vaucoupin lies to the northeast of the village of Chichée on a slope that overlooks the Serein River and faces primarily due south. The Picq parcel is in the steepest section of the vineyard, on a forty-five degree slope and must be completely tended by hand, including at the all important harvesting time. It is a beautifully situated premier cru, which produces a wine with a lovely chalky, oyster shell base of soil, and notes of spring flowers and beeswax augmenting the lovely tart citrus core of fruit. The premier cru of Vosgros lies to the west of the village, on a slope that also includes the premier cru vineyard of Vaugiraut, and has a more varied exposure that generally faces east. The Vosgros vines were planted in the 1980s and tend to produce a beautifully tensile and complex Chablis that starts out life with a youthful austerity, but unfolds brilliantly with bottle age to deliver a racy, complex and minerally expression of Chablis. It is the longest-lived wine in the Picqs' fine portfolio of wines. 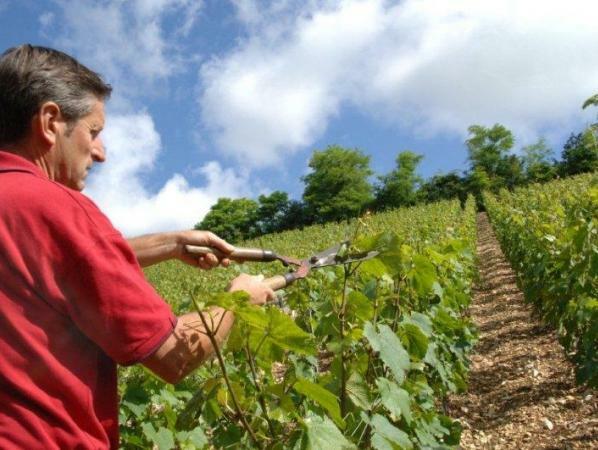 Didier Picq is deeply respected by his peers in the region and always makes himself available to fellow vignerons, especially the youth of the region. He exudes endless love for wine and is a truly positive force in the world of wine. We are honored to work with him and his siblings."